Plant fibres for Spinning, making Paper Clay etc. Buy our plant fibres for spinning and dyeing. Our range includes white Egyptian cotton, which is a long staple cotton, ramie, which is a type of nettle, flax and jute. Ramie & rose are back in stock and we have flax & hemp stricks. When it is too warm to spin wool, plant fibres are a great alternative, and great for cold weather too... Our plant fibre is supplied as tops or stricks and usually sold in multiples of 100 or 250 grams. Read more about our plant fibre for spinning. This is high quality cotton, with a long staple which makes it easier to spin. You can spin it on its own or try blending it with ramie to reduce shrinkage or with silk to increase lustre. Cotton is very absorbent and suitable for warm weather clothing. And cotton is easy to care for. 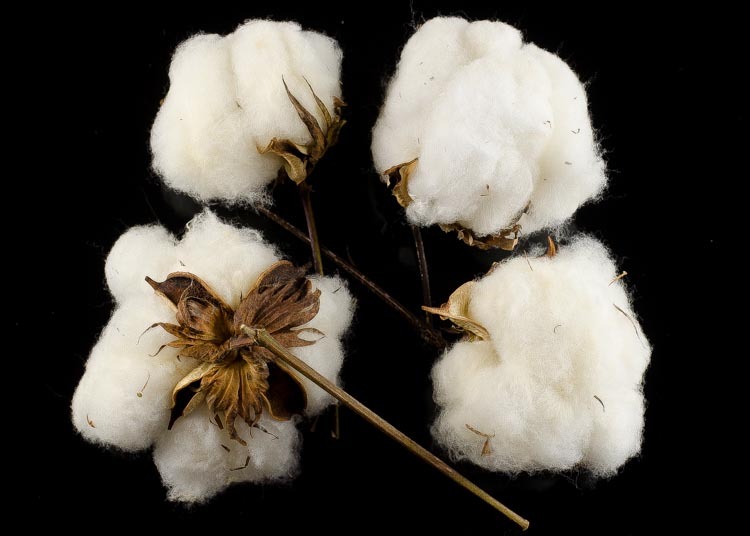 Read more about Cotton and buy Cotton Bolls here. Ramie is a type of stingless nettle grown in China and other Asian countries. Ramie is white and lustrous and looks like silk, it is more absorbent than cotton and, unlike cotton, ramie does not shrink. Ramie fibre can be spun into a fine yarn and you can spin it the same way you spin tussah silk. The yarns may appear a bit stiff, but they will soon soften with age. Ramie creates fabrics that breathe and makes great summer clothing. Jute fibres are very long, silky, lustrous and golden brown in colour, and very easy to spin. A great way to get started with spinning! In contrast to most textile fibres which consist mainly of cellulose, jute fibres are part cellulose, part lignin. Jute fibre has strength, low cost, durability and versatility. More plant fibres coming soon. Let us know via the Wild Fibres contact form what else you would like to see!